Es Figueral beach is a small white sand beach sourrounded by nature. Located only 10 minutes from San Carlos, Es Figueral has also a lot of activities and facilities to please each member of the family. Among the services that Es Figueral offers to its visitors, we can mention hammocks, sun umbrellas, showers, lifeguards and access for disabled persons. You can easily relax lying on the sand and enjoying the nice atmosphere, while reading your summer book or just sunbathing. However, if you are an active person, you will also find a lot of options to practice your favourite water sport. Windsurf, pedal boats, water skiing, banana boat or diving are just examples of the wide range of activities you can practice in this amazing beach. 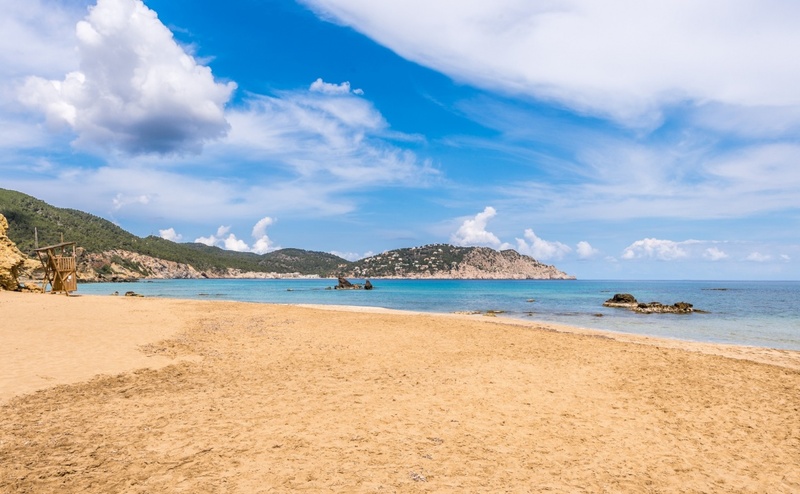 With its 350 meters long, Es Figueral is one of the longest beaches in the island of Ibiza. Nevertheless, its only 5 meters wide, gives the visitors the impression of being in a small beach. It offers a nice promenade through its green hills and its rocky coasts. You will be so delighted by the green scene that you will not want to leave this place. Es Figueral is, for all this reasons, a perfect place if you want to combine the best of a small cove and all the facilities and comforts of a big beach. At the frontline there are some restaurants and nice shops to buy souvenirs for all your friends in your country. Visiting this beach is a nice thing to do if you want to go back to your country with a nice souvenir of your island holidays. To get to Es Figueral by car, you have first to reach San Carlos town, which is located at the north of Santa Eulària, and follow the indications. During the summer months, there is also a public bus service. If you prefer to stay on the area, there are some hotels or even rural houses to be in a more relaxed ambiance. With all these services, now you do not have any excuse to not visit this incredible place. Find information about selected Hotels, apartments and rooms in Playa es Figueral to choose the perfect place for your accommodation.